Thorough inspection of your home or business. Strategic vacuuming with state-of-the-art HEPA equipment. Thermal remediation heat treatment throughout infested areas. Professionally trained technicians to provide a safe and effective service. Apply environmentally friendly green insecticides to wall voids and heavily infested areas. 2 follow-up inspections after initial service to ensure bedbugs are gone. $100 Off Initial Heat Remediation Treatment for bed bugs. Click here for coupon. Environmentally friendly process has now been adopted in the industry for bed bug control. Heat treatment is widely regarded as one of the most effective solutions for bed bugs. Portable heaters, either electric or propane-fired, are used to gradually heat the ambient air within rooms to above 120º F while monitoring with strategically placed temperature sensors and infrared thermometers. This high temperature is then held for 4 to 6 hours or more depending on the level of infestation, and relative level of clutter in the treated rooms. NOTE: Heat treatment is a low-risk option for customers (and their pets), and the environment due to the minimal use of pesticides. The service can be completed in just one day rather than over the course of a few weeks, and it’s effective against all life stages of a bed bug. Bed bugs can find their way into your home from just about anywhere – hotels, gyms, place of business, and retail stores just to name a few. They use luggage and personal belongings to hitch a ride into your home and once inside they can be very difficult to control. The professionals at Champion Termite & Pest Control are trained and certified to quickly identify and eliminate your bed bug infestation. Whether at your home or place of business, Champion Termite & Pest Control guarantees to solve your problem. Bed bugs can be brought back into your home or place of business at any time. There is no way to prevent them from re-infesting so Champion Termite & Pest Control cannot guarantee that you will never see bed bugs again. We will, however, guarantee to eliminate your problem for at least 30 days and will return to provide any additional re-treatments within 30 days from initial service. Keep your property free from bed bugs and other bothersome pests with the help of our exterminators. Take advantage of our thermal remediation heat treatment and allow us to help you eliminate a bed bug infestation. Schedule an appointment today! 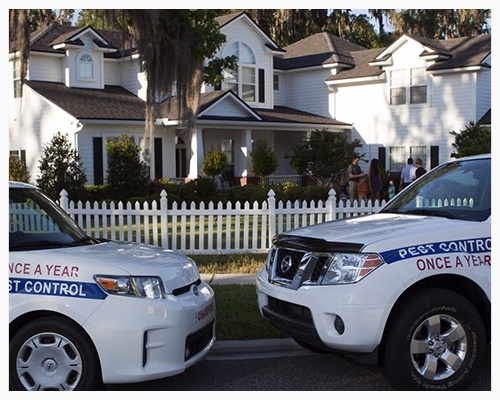 Give us a call (386) 329-9700 using the number listed on this website to learn more about our pest control services.